Click here for reservations on Spurs game nights. Click here for reservations during the San Antonio Stock Show & Rodeo. 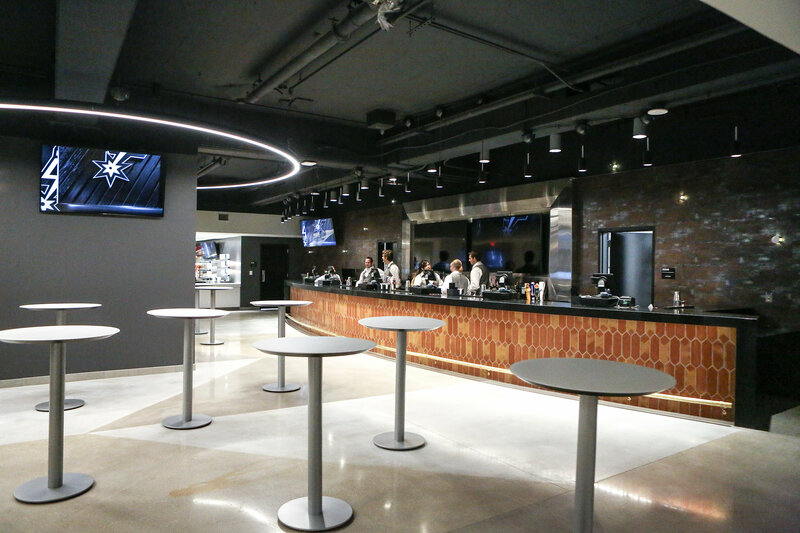 This high-energy restaurant and bar is available to Suite, Superbox, Courtside Ticket Holders, and Sponsors during every Spurs home game. From exciting new gourmet dinner entrées to mouthwatering house-made desserts, freshly tossed salads and fresh meats cooked to perfection, it’s dining for the hardiest of appetites. Complement your meal with a selection from the fully-stocked bar, complete with an extensive list of premium cocktails, imported and domestic beers and Captain’s list wines by the bottle or glass. Our Famous Chef’s Table and hospitality create an unforgettable dining experience. The SWBC Terrace Club Restaurant opens two hours before tipoff. Reservations are highly suggested! Private Event Planning? Consider The Terrace Club Restaurant on Non-Event nights for weddings, rehearsal dinners, corporate celebrations or social gatherings by calling our Sales Office at 210-444-5919. Located on either side of the Charter Level, Levy Restaurants offers a variety of Mini Restaurants that give a twist to the Arena experience. Levy signature items include: Farm to Fork featuring local sustainable and renewable items and the Rancho Grande with premium hand-carved selections as well as traditional game-time fare. At the heart of Saddles & Spurs Club are two Premium Sports Bars fully stocked with premium cocktails, imported and domestic beers, wines and a variety of frozen drinks. Have a craving for a pub experience, try our Craft Biergarten. This area features micro brewed beers paired with an especially selected Chef’s menu item. Reservations are not required as this is a casual up-scaled public concessions area. 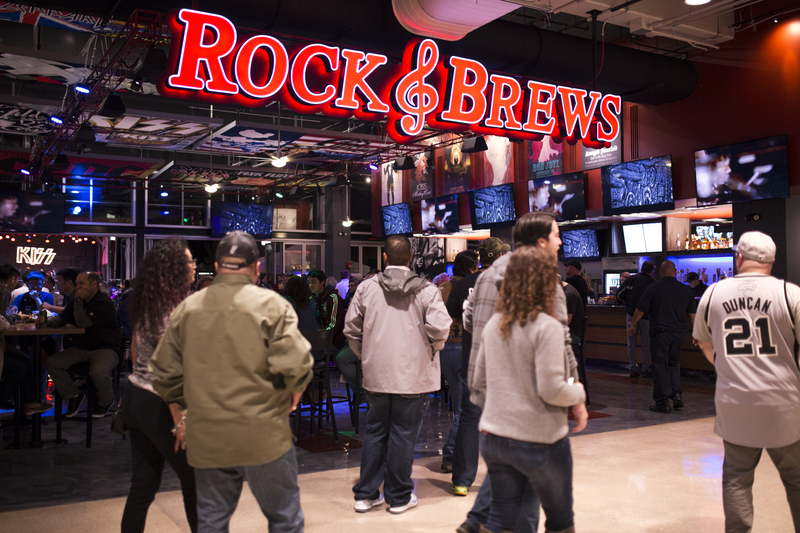 Rock & Brews Restaurant and Bar opened its second arena location at the AT&T Center in San Antonio, Texas outside of section 114! The venue is an energized indoor/outdoor dining and entertainment complex featuring quality American comfort food and a broad selection of craft and international beers. The rock-inspired atmosphere pays tribute to rock icons and other artists who have performed at the Center with a great wall of rock and over-sized canvas art on the walls and bold rock-themed flags overhead. Multiple screens show rock videos and major sporting events. For more info visit: http://www.rockandbrews.com/att-center. 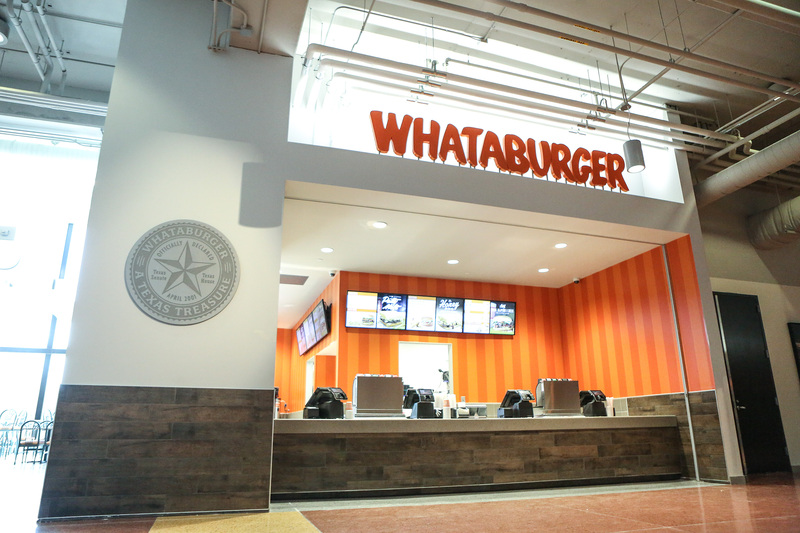 Whataburger is now open to the public Monday-Friday 8am-3pm and all event days!